Martian Risk: slight except during mid-day invasion from Planet Rhodes. 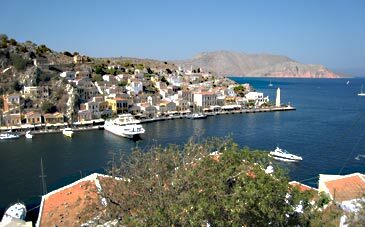 With no “musts” to be seen (just one optional monastery) Symi is an island devoted to unabashed holidaymaking. Stunningly beautiful, with traditional sea captains' houses surrounding Gialos, one of the finest natural anchorages in the Mediterranean and one of the most picturesque. 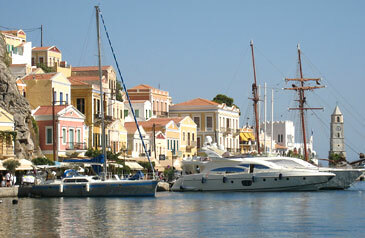 The island is now quite sophisticated with smart bars and restaurants supplementing traditional tavernas. 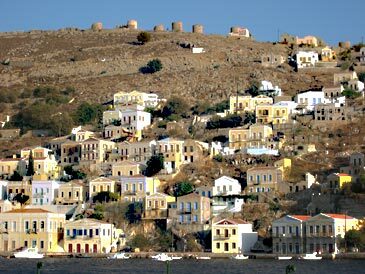 At the top of the 450 steps of the Kali Strata, Symi’s main thoroughfare, is Chorio, where most of the locals live. A swathe of greenery sweeps down from here to Pedi Bay, where there is a man-made sandy beach and two more natural coves on the south side of the bay. 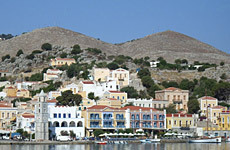 A bus runs from the harbour via Chorio to Pedi and less frequently down the length of the island to the monastery of Panormitis. Shortly before Panormitis you see Marathounta where our old friends George and Anna have built a small row of cottages on the edge of the crystal clear waters of a calm inlet. Between the beach and the road there are olives, vines, lemons and oranges – George’s dream of organic living is coming to….well, fruition. This is an idyllic spot for unwinding – and you don’t have to starve because the taverna on the beach serves excellent meals all day, using George’s organic produce whenever possible. Some of the organic produce, in the shape of the odd donkey, has been sighted quietly nibbling at beach picnic packages. There are a few hotels on the island, but hundreds of studios and villas – far too many to list here; all we can do is give you a taste of the range available – some overlook the harbour, others are tucked away in the upper village (Chorio), but there are also a few at Pedi, not to mention George’s at Marathounta. Tell us what you want and we will tell you what’s available. The studio/villa descriptions on this site are merely typical examples. Charter flights from most UK airports serve Rhodes direct (usually Weds). 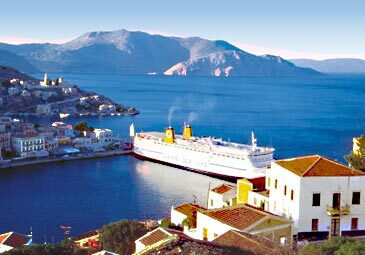 Morning and evening ferries/hydrofoils cross to Symi in 45-90 mins. Scheduled flights involve an easy change of plane in Athens. 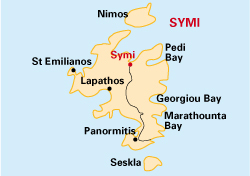 Symi may easily be combined with Tilos, Rhodes, Halki or Kastellorizon. 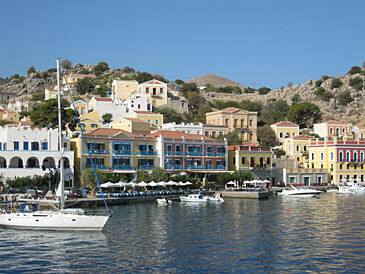 All round Symi bays abound with crystal clear water. Most visitors take a caique to a deserted bay for an all-day picnic with wine provided. This has the incidental advantage of getting you away from the harbour during the short mid-day period when the excursion boats deposit Martians from Rhodes. On Saturdays an excursion caique takes you to Datça, a short sail away on the Turkish coast, where you can experience a different culture and enjoy the local market; why not bring a camel back for the family? 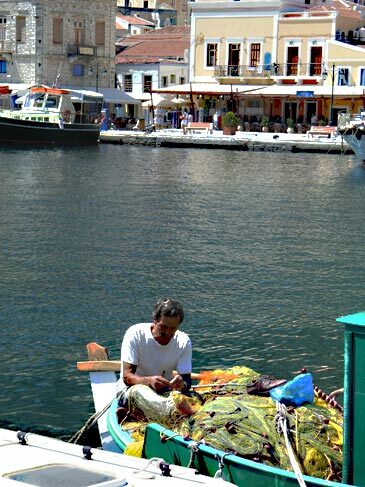 Walking on Symi is another option: pick up a map so that you know where you are. By the time you are back from your walk (or beach picnic) the Martians will have gone and the locals will revert to non-rip-off mode for their real guests. In the evening Symi’s harbour-front bustles, as does Chorio, the upper town. 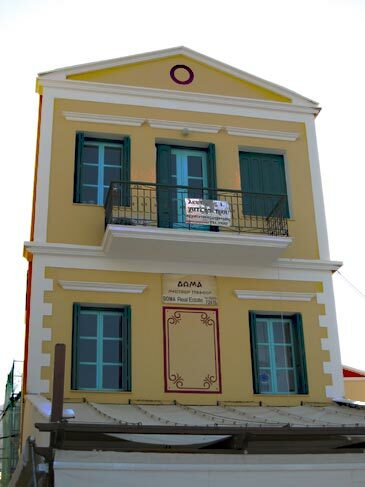 Both have dozens of tavernas and restaurants, ranging from traditional to unusually sophisticated. Views of the harbour from Chorio are breathtaking. 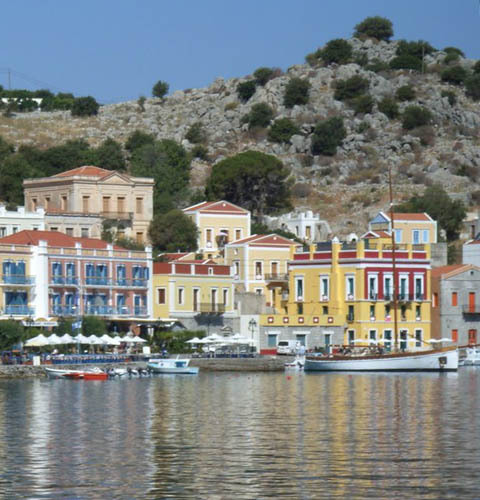 Symi has a healthy year-round population, making it a good choice at least for the October-Christmas period and in spring, starting whenever [Greek] Easter falls. The scenery in the interior is dramatic and amazingly fertile in parts and the views to Turkey magical. Avoid the harbour when excursion boats from Rhodes unload their Martians for about three hours from mid-day. Symi’s beaches almost always consist of clean pebbles and shingle giving on to the clearest sea you could wish for; only Pedi has [imported] sand. 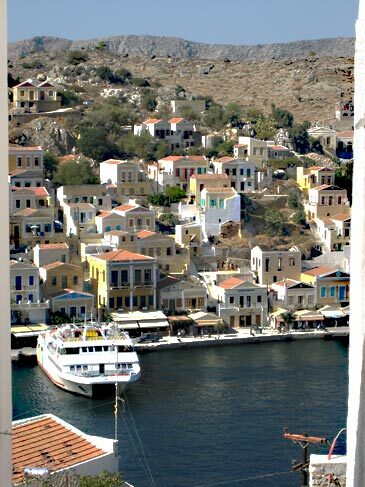 Symi is the only island with a harbour enclosed on all four sides. Right on the harbour front near the clock tower with good views from its front rooms and terrace. Two villas opening right on to Marathounta beach. Fabulous views over the harbour from its terrace. Airy living room with twin beds and doors on to a balcony. The bathroom has a half-bath/sh. Near Kali Strata steps. A recently opened village-style cluster of 19 luxurious two-floor cottages and six studios round an attractive garden flanked on one side by the open-air bar and on the other by the plunge pool built into something resembling a medieval market-cross in England. The cottages have an extra room downstairs for children and can therefore accommodate up to 6 persons. Fully equipped kitchens, satellite LCD TV. safe-box, air-conb, heatng. All rooms have view of pool and garden. SCB 2-6 persons. 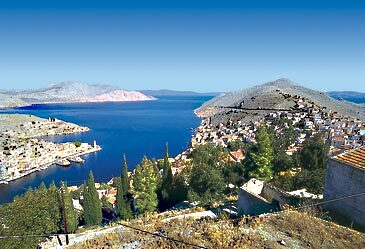 The original posh hotel on Symi's waterfront, the Aliki is an old manor house lovingly converted into a small exclusive hotel. Every room is different (mainly because major alterations would have flouted the strict planning laws), some having sea view, some not and some higher rooms having access to a covered balcony; there is also a roof terrace with lovely views.